The devastated family of a 23-year-old man, who was found dead at the roadside with injuries consistent with a hit-and-run collision, is appealing for anyone with information to come forward. 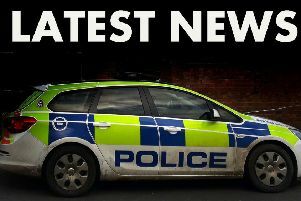 Chase Tate, formerly known as Chase North, was found lying next to the A1104 at Miles Cross Hill, Ulceby, in the early hours of Saturday (January 7). This afternoon (Tuesday), police confirmed that Mr Tate’s injuries were consistent with a hit-and-run incident. Earlier, Sergeant Dave Mitchell, the Senior Investigating Officer, had said: “Chase was a 23-year-old. He didn’t deserve to die. “Someone - and probably more than one person - knows what happened that has led to his death early on Saturday morning. “I cannot believe anyone wants his death on their conscience. “I am very open-minded about what has happened. “It was dark, and Chase has been described as being unsteady on his feet and wearing dark clothing. “I appeal to anyone who knows anything to come and speak to us. I ask that anyone who had a visitor to their home or work, maybe a delivery or friends or relatives visiting who may have travelled on the A1104 in the area of Ulceby, between 4am and 6am on Saturday morning to call in. “Please think if you know anyone who could help us with information; let me decide if this is relevant information. • If you have any information, call Lincolnshire Police’s non-emergency number 101, quoting incident 54 of January 7.